Firstborn of Aisha Edna Suleiman. Wow…growing up in Croc City was simple. I miss that the most, the simplicity of life. School, lunchboxes, mother’s baking, Voltron super ted and sesame street. Friends who were like extended family. And the beautiful weather. And kaduna was SO safe!!! Like we didn’t have a fence until I was in Uni!!! – What are your major influences in life? My Mother. She was my everything. Creatively, my influences are diverse. From the cartoons I saw as a child, to Michael Jackson, to Robert Ludlum, Ted Dekker, The Wachowski brothers, Guy Ritchie, etc. The list is endless, as you can imagine seeing as I am very interested in different forms of artistic expression. – How did you develop your sense of humor? Hahaha. Mahn…it would just HAVE to be hanging with my mom and sibs. My family is ridiculously funny. I am the least humorous in my home. That should tell you something. – As a multi-creative, list your talents in order of preference. Dude. This one no possible o. Hahaha. I’d say artistically, I have seasons. Sometimes Digital Art has all my attention. Few weeks later, I get a dance project and I breathe dance. Then it could be Acting, or Writing or Architecture and so on. It just depends on the season really. – Is there anything you can’t do that you wish you could? I honestly wish I could play the piano. – What’s your dance story in summary? Wow…That’s a whole book’s worth of story telling you’re poking at o.
I picked up dance on the campus of ABU zaria at the age of 17/18. Then I got saved, joined YWAP and was made the head of the dance department (SOULDQUEST) we went on to put up over 100 dance based concerts on almost every federal university campus in Nigeria and a number on campuses in Ghana, Benin Rep etc. Then we went on to win The Malta Guinness Street Dance Africa 2008. After that, I became a brand ambassador for the brand, did tvcs for them, GTBANK, MTN, interswitch, etc. – What would you say was your first big break in entertainment? – At the time, what did you like about it the most and the least? I loved the fact that we had a access to a larger audience. Didn’t dig the impression people had that if you’re an entertainer, you’re a heathen. – What valuable lessons have you learnt from the Nigerian entertainment scene? Maintain your day ones, they’ll help keep you grounded. The brands don’t care about your values. Help as many people as you can, but remember to keep climbing. – As a creative what do you prefer, working behind the scenes or in the limelight? There’s more money there. Lol. – What do you consider to be your biggest achievement to date? To be honest…I don’t think I’ve achieved much as an entertainer. As a person, now that’s a whole different story. – Having worked with a lot of young talent over the years, what are the major challenges they face? They are in such a hurry, it is heartbreaking. So instead of being a steady flame for 2 decades or more, They’re just a firecracker for a festive season. – So Captain Quest, if you could have a super power other than dance, what would it be? The thought process of the human mind fascinates me. So I’d love to read minds. SeekYouArt started off with me attempting to find myself creatively every day. Basically take what I learned yesterday, apply it in different ways today and see what I learn from the process which I’d use tomorrow. It then inevitably evolved into a series of pretty dope pieces of art and a couple of people started placing orders for wall art. Then t-shirts. Then mouse pads, dogtags, tote bags, etc. – If asked to describe the last 12 months in 3 words, what would they be? – If you had to travel what would be the two things you would not do without? My digital work device and bank cards. I’ve always been a passionate dance enthusiast and my frustrations with the industry were deeply rooted in the myopia that ran deep in the artists, the insistence of maintaining a status quo that had obviously done more harm than good and the celebration of mediocrity hinged heavily on ignorance and the lack of exposure. Qudus has chosen to explore the growth option, using his platform and access as a spring board for the growth of the dance industry rather than self-grafitication. 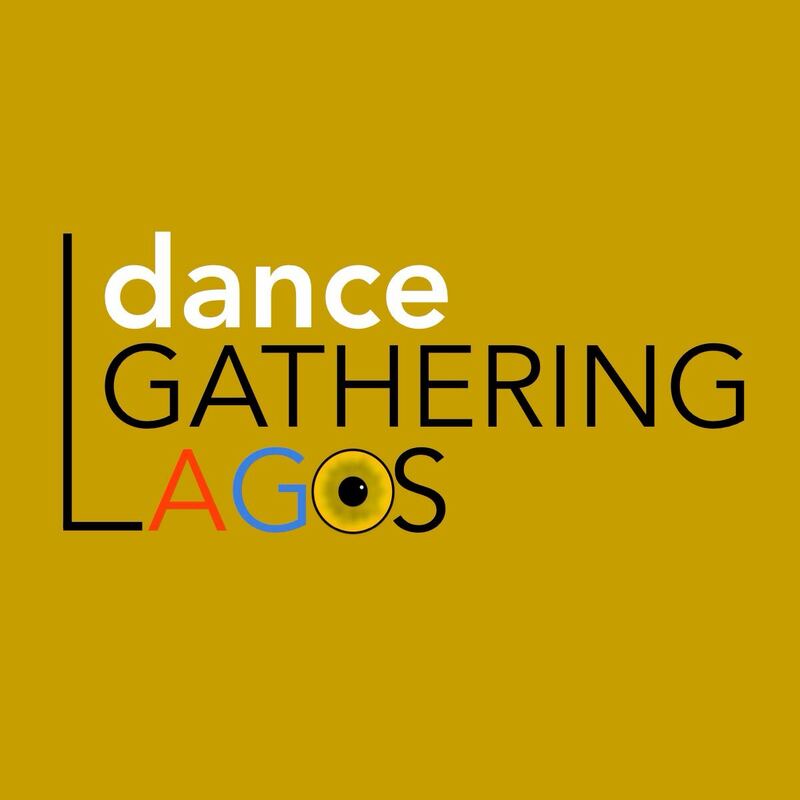 The Lagos Contemporary Dance festival, also known as #danceGATHERING, is a five day activation and celebration of dance, preceded by an intensive dance training program called danceLab which runs into the festival and lends pieces to the final dance exhibition at the end of the festival. The festival went beyond training and opened up hotspots for artistic exchange all over Lagos through various events like CROSSINGS (a conversation between two artists with various means of expression) and dancingCities (a street dance performance by artists within the community of choice and guest performers) all of which formed the body of festival. The road map we followed throughout the festival was enough to cause one to think outside the box. The line-up gave no room for old thoughts only possibilities. Though the year’s theme was MO•[VE]•MENTS, I experienced it within the various kinds of human interaction and the visible effects it had on the parties involved, be it the teacher-student relationships between the guest instructors and the participants of danceLab, the somewhat silent partnerships between the artists of CROSSINGS or the message passed from performer to audience. Words truly do not do the festival justice. Stand out performances for me on the final days were ‘Fatou Tas Tout Fait’ by Fatoumata Bagayakou which addressed female circumcision with a haunting yet liberating appeal, ‘Iwalewa’ a piece I had seen in snippets but was finally able to witness in its entirety and was brought to tears by (yes I’m a cry baby but it’s got to be good work to open the flood gates) and of course ‘Ijo Agba’ because the music of the piece brought back loads of memories and I found the fusion of indigenous music and urban Nigerian dance styles, rather amusing. There’s so much to say and I honestly would like to go on but for fear of boring your socks off, I’ll stop here and say some experiences are best had in person than through the words of another, so brace yourself for #danceGATHERING 2018 so we can experience it together. For now check out danceGATHERING on Instagram, Facebook, twitter and qdancecentre.com for more details. Chei, the English it haff finish. I’m out. Lagos is set to play host to dancers and choreographers from Lagos, Ibadan, Abuja, Kaduna, Bamako, Tunis, Maputo, Washington and Paris, in a major dance gathering the country is yet to witness this year. The QDanceCenter, a brainchild of Nigeria’s foremost dance export, Qudus Onikeku, is back this year with the debut edition of danceGATHERING | Lagos Contemporary Dance Festival. This mammoth project has garnered the support of the National Theatre, Institut Français, Goethe Institut and has been adopted by the Lagos @50 committee under the chairmanship of Prof. Wole Soyinka. 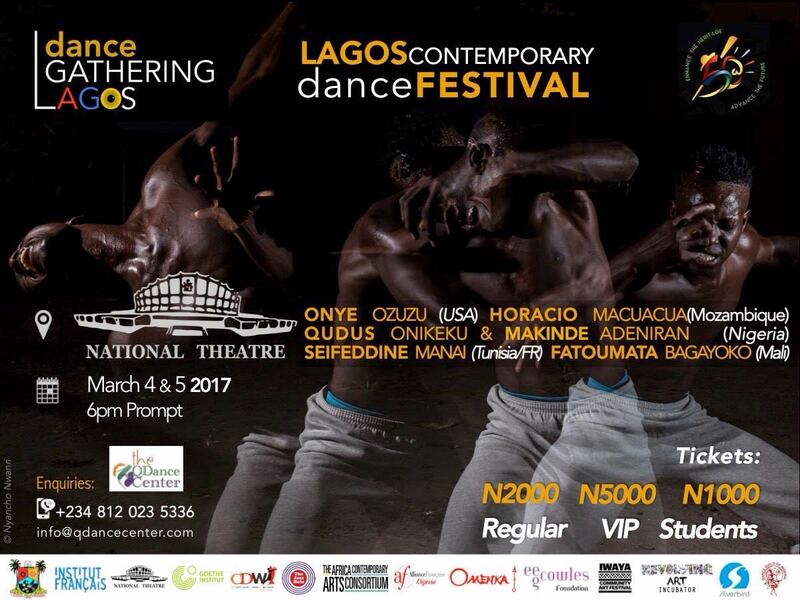 The danceGATHERING is a two-phased project with a two-week long dance lab (20 Feb. – 5 March 2017) followed by a five day dance festival (1 – 5 March 2017) in various venues around Lagos. Lagosians will witness an outpour of dance performances, exhibitions, international creative collaborations and exchanges including DANCING CITIES and CROSSINGS, amongst others. The gathering also aims to provide an array of opportunities for dancers across the country. The festival will close at the National Theatre, with works by Onikeku himself along side a host of others, in collaboration with one of Nigeria’s leading theatre directors, Makinde Adeniran (of Saro, the musical). danceGATHERING is the first of its kind in Nigeria and arguably West Africa, and we invite YOU to be part of this history-making event from February 20th to March 5th, 2017.
danceGATHERING : Repositioning dance in Nigeria. Lagos is set to play host to dancers and choreographers from Lagos, Ibadan, Abuja, Kaduna, Bamako, Tunis, Maputo, Washington and Paris, in a major dance gathering the country is to witness this year. The indefatigable QDanceCenter, a brainchild of Nigeria’s foremost dance export, Qudus Onikeku, is back this year with the debut edition of danceGATHERING | Lagos Contemporary Dance Festival. The laudable project had been given a major backing by the National Theatre, Institut Français, Goethe Institut and adopted by the Lagos @50 committee under the chairmanship of prof. Wole Soyinka. Within two weeks, Lagosians will witness an outpour of dance performances under DANCING CITIES and the INTERNATIONAL DANCE PLATFORM, there’ll equally be a dance and photography exhibition with the theme of MO|VE|MENTS, featuring 9 brilliant photographers from Lagos and Abuja, also in the program is CROSSINGS – an exciting creative space where 16 top Nigerian and international artist(e)s are paired to, share notes on their creative process andthought patterns before a live audience, not forgetting the MASTERCLASSES offered by the best in the field of dance, for practicing and prospective dancers. At the danceGATHERING, there is something for everyone, and all the activities build up to the CLOSING NIGHT at the National Theatre, featuring two major works, one by the participants of the festival and another choreographed by the travelled dancer, choreographer and convener of the gathering himself, Qudus Onikeku, in collaboration with one of Nigeria’s leading theatre directors, Makinde Adeniran (of Saro, the musical). For a Lagos Contemporary Dance Festival, where there are millions of people to be reached, danceGATHERING seeks to find new ways to be much more significant within such landscape, challenging both the local and visiting artistes to step out of bounds, provoke reactions and insist in being fully part of the city life, creating situations where a wider range of audience is stimulated and entertained, by providing for them a palette of diverse dance forms, both from the local and international dance artists. In that, the festival is therefore working to include dance, as part of the art forms rendering visible the multiple juxtapositions that shape daily life in Lagos. danceGATHERING is the first of its kind in Nigeria and arguable West Africa, and we invite you, a member of the fourth estate of the realm, and the people of Nigeria to be a part of this history-making event from February 20 to March 5 2017.